When you’ve just roasted a whole, double turkey breast for a household of two people, odds are good that meals for the next several days will involve sandwiches. That’s not a bad thing considering how versatile a turkey sandwich can be, and it’s even better when you’ve just read the recipe for jibaritos in Daisy: Morning, Noon, and Night . A jibarito is a sandwich in which the bread has been replaced by slices of fried plantains. Apparently, the original jibarito was made with beef, but Daisy suggested leftover turkey breast pavochon. This sandwich is usually built like a cubano with a primary meat (turkey in this case but it's often roast pork), ham, swiss cheese, mustard, and sliced pickles, but I omitted the ham and used all leftover turkey. Once assembled, just like a cubano, it’s toasted in a panini press. It sounded delicious but maybe a little on the heavy side considering the ‘bread’ is fried plantains, but I had to give it a try. Plantains were peeled and sliced lengthwise. Since the plantains I was using were large, I cut each piece in half crosswise as well. They were fried in canola oil for a total of five minutes and were turned at the halfway point. After this initial frying, they were drained on paper towels and allowed to cool just a little. While still warm, they needed to be pounded down to a thickness of one quarter inch. I used a meat tenderizer for this fun task, and they easily flattened out to an even height. After smooshing the plantains down to size, they were fried a second time to crisp them, and again, the frying time was five minutes total with a flip after two and a half minutes. I used firm, green plantains, and they held their shape very well, crisped nicely, and didn’t seem to absorb the oil. 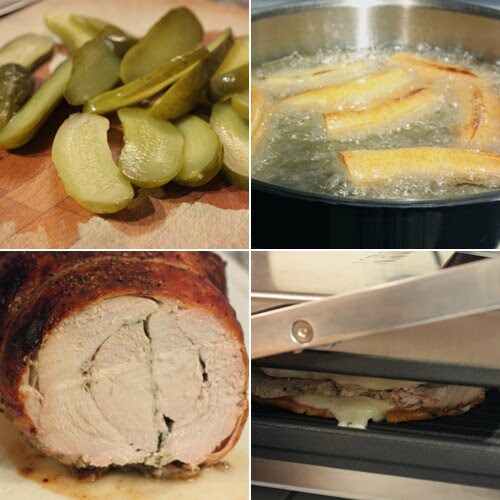 The sandwiches were built with slices of the roast turkey, swiss cheese, sliced dill pickles, and mustard. They spent about six minutes in the panini press, and came out looking toasted, golden, and just gooey enough in the middle. I have to mention again that I was really happy with the texture of the plantain ‘bread.’ It wasn’t mushy or greasy at all, and it delivered a satisfying crunch. Of course, the melted cheese, pickles, and well-flavored turkey were great on the inside too. As I had guessed, this was a filling sandwich. One small portion was enough for a meal for me, but it was a lip-smackingly good meal. This looks sooo good, I'm reduced to just saying, 'Wow!' The first photo is about as perfect a shot as could be. I love fried plantains but using them as 'sandwich bread' substitute is awesome! How cool is that sandwich... and pretty too! WOW!! Very otiginal and so tempting! That is an awesome recipe! I love plantain so much, this must taste like heaven. Would love to have this for lunch. Thanks for the idea Lisa! I was drooling just looking at the first photo, never dreaming it was a plantain! And I love them. I'm amazed they didn't break apart when you pounded them. I'm definitely going to try your jibarito sandwiches! Love the turkey/cheese idea too. Another completely new and interesting recipe for me....looks so tempting! What a sandwich! The sweet and salty combination is perfect. Oh, and the elements of melty cheese and crisp plantains. That is really perfect. By far the coolest sandwich ever, so creative and amazing! This is just so cool!!!!!!!!!!!!!! Where's mine? Wow this looks fantastic! I adore plantains. As in I have a serious passion for them. But I would never have thought to use them as bread in a sandwich! Great idea. Thanks for sharing it with us. The one thing that never ceases to amaze me about food is that you can learn something new everyday! And when your a blogger with foodies from all over the world sharing their recipes you can learn even more than one new thing every day. Thanks for giving me my first one of the day! 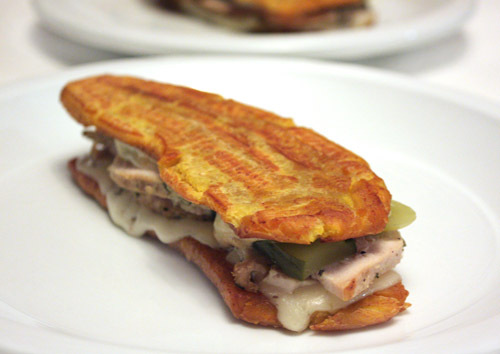 This is an awesome way to make a Cuban sandwich! What a really cool idea. I LOVE plantains. I would love to experience them like this! I love the plantain slices!!! That's really neat to use that instead of bread. Love it. One of the things I want try making is mariquitas, which are basically fried plantain chips. But now I was to try making this!!!! It's definitely an awesome twist to a Cuban sandwich. best use of the plantain i've ever seen. actually, one of the best sandwich-type creations i've ever seen, period. what a treat--great find and wonderful execution, lisa! using plantains as the "bread" sounds so delicious! wonderful combination. This is so cool! I have had plantains many different ways, but would not have though to use them as sandwich "bread". These look and sound spectacular! Totally delicious and very mouth watering. I would love to try this - what a treat! These look so tempting and delicious!! Jibaritos are the BEST sandwiches -- congrats on making your own! we live in a wonderful neighborhood where jibaritos can be found in almost every restaurant, so I haven't been inspired to make my own -- but I may be now! Wow!!! I've never had a jibarito! But my boyfriend would LOVE this. I think I am going to make them for him this weekend! Plantain bread?? That is very innovative!! I love the idea of this sandwich with plantain for the bread, awesome! Wonderful sandwich. Thanks for the recipe. 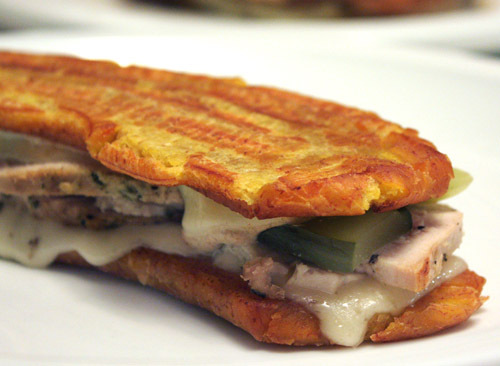 I love this idea with the plantains, and that sandwich looks simply amazing. I may be biased for anything cubano, but holy cow, this sandwich is speaking to me on many levels. Oh yum! I love the idea of plantain chips as bread! This looks delicious. Living in Florida I eat Cuban food A LOT. This is a really surprising and interesting twisting-que bella! Wowsers! I would never have thought those were platains. Excellent twist! So, I'm assuming you need to eat it with a fork & knife, huh? Snooty: You know, I thought the same thing about needing a fork and knife. Actually, these plantains held up so well, the sandwiches were pick-upable. The greener the plantain the better for sturdiness. That also prevented them from being sweet.